Heat oven to 400F. Cut a piece of parchment paper to fit the bottom of a half sheet jelly-roll pan. Thoroughly shake or whisk together the Cinnamon-Pear Balsamic and Butter Extra Virgin Olive Oil. 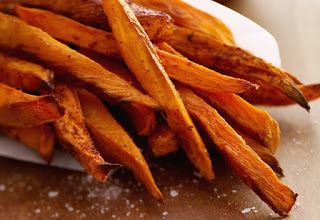 In a large bowl toss to liberally coat the sweet potato wedges with the emulsified balsamic-olive oil mixture. Arrange the potato wedges on the parchment paper lined pan in a single layer, without over-crowding. Sprinkle with sea salt and roast for 45 minutes until tender and the balsamic glaze has caramelized.